The GY-HMQ10 was developed using the most advanced technology found in any professional camcorder. High resolution (4K+) still picture imaging has been around for several years in point and shoot digital cameras. Motion video capture with these cameras has always been done at a lower resolution because of lack of processing power. Likewise, high end digital motion picture cameras can capture 4K images, but often provide a raw data output to an external storage array for later processing—again due to lack of processing power in the camera. There just hasn't been the ability to capture, process and record full 4K images in real time in such a small form factor until now. 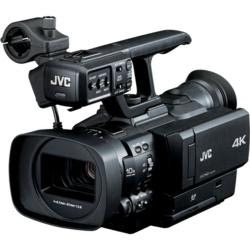 Shop JVC Professional Camcorder for LE$$ / Price list Click here!